The Micromax X450 VanGogh is a Dual SIM GSM Phone with Dockable Bluetooth, features a 2.6 inch QVGA TFT display with 262K Color, 2 mega-pixel rear Camera and has pre-installed apps such as Opera mini, IM services like Facebook, Yahoo, MSN etc. The X450 VanGogh has a USB port residing on the top, memory expandable upto 8GB, dual Standby, FM Radio, 3.5mm jack, music player supporting MP3,AMR,MIDI,WAV formats, video player supporting AVI,3GP,MP4 formats. For network it has WAP web browser with GPRS,Bluetooth with A2DP which helps you to transfer files. The Dockable Bluetooth gets charged from phone battery when docked. The X450 VanGogh has a dimension of 116.7x52x20.3mm and powered by a 1000mAh Li-ion which delivers 4 hours talk time and 13 days of standby. 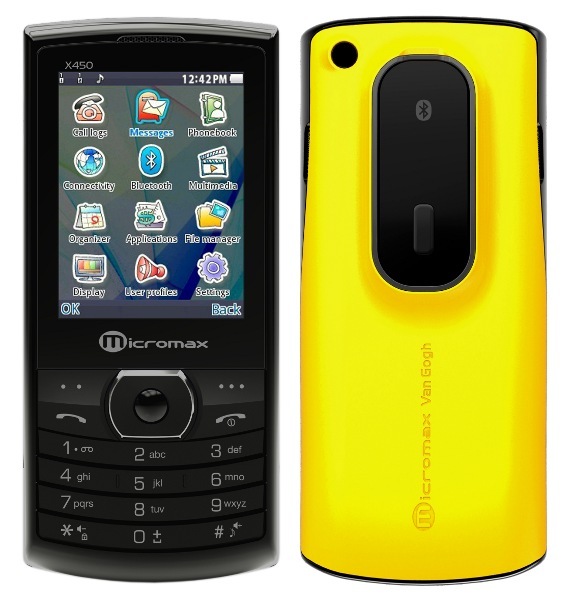 It is already available in India with a price tag of INR3,499 which comes with 2 colored interchangeable back panels. Tags:Micromax X450 VanGogh, Micromax X450 VanGogh features, Micromax X450 VanGogh specifications, Micromax X450 VanGogh review, Micromax X450 VanGogh details, Micromax X450 VanGogh availability, Micromax X450 VanGogh specs, Micromax X450 VanGogh images, Micromax X450 VanGogh pics, Micromax X450 VanGogh pictures, Micromax X450 VanGogh price, Micromax X450 VanGogh cost, low cost mobiles, dual sim mobiles, low cost bluetooth dockable mobile.